The secret to the towering meringue is that it uses eight egg whites, more than twice the amount in typical meringue pies. 1 of 4 Mix flour, sugar, salt in bowl. Using pastry blender, cut in margarine until coarse crumbs form. Gradually add water, tossing with fork, until pastry comes together. 2 of 4 Roll pastry out on floured surface to 13-inch circle. Roll pastry up on rolling pin; unroll into 9-inch pie plate. Fit into plate; don't stretch. Roll edge under for stand-up edge; flute. Chill 30 minutes. 3 of 4 Heat oven to 425 degrees F. Prick crust all over with fork. Line with foil; fill with dried beans or rice. 4 of 4 Bake in 425 degree F oven 15 minutes. Remove foil and beans. Bake 8 to 10 minutes, until edge is golden. Cool. 1 of 3 Grate 2 tablespoons rind, squeeze 3/4 cup juice from lemons. Mix sugar, cornstarch, salt in saucepan. Stir in water, lemon juice. Cook over medium heat, stirring, until thickened and bubbly, 15 to 20 minutes. Cook another 2 to 3 minutes, stirring. Remove from heat. 2 of 3 With fork, beat yolks in bowl; stir in 1/2 cup hot lemon mixture. Stir yolk mixture into lemon mixture in pan. Cook over low, stirring, 1 minute (dont overcook or eggs will set). Off heat, add butter, rind. Pour in crust. 3 of 3 Place oven rack in lower third of oven. Heat oven to 325 degrees F.
1 of 2 Beat 8 egg whites and cream of tartar in large bowl until foamy. On high speed, slowly beat in 3/4 cup sugar, a tablespoon at a time, until stiff peaks form. Spoon meringue over filling, spreading to edge of crust to seal to prevent shrinkage. Swirl in peaks. 2 of 2 Bake pie in lower third of 325 degree F oven 30 minutes (instant-read thermometer inserted in meringue registers 140 degrees F). Bake 3 minutes longer. Cool on rack at room temperature up to 2 hours. Refrigerate at least 1 hour. 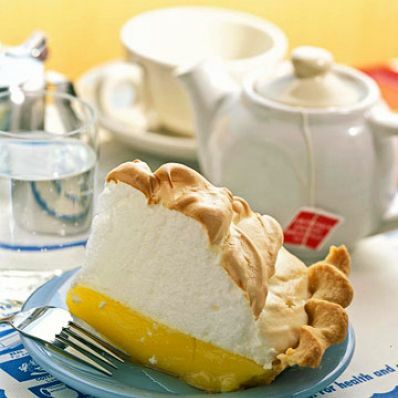 Pie may be refrigerated longer, but meringue will not cut as well. Makes 8 servings.